Fellow seamster’s and seamstresses – online and in the real world. I love reading everybody else’s blogs. I’ve met some lovely people in real life last year and I love that I’ve found true friends who I can chat with about my sewing obsession and theirs. And they don’t tell me off about how much fabric I’ve got 🙂 True friends! I’m looking forward to meeting more of you in 2014! Technical Genius – I love reading books on technical sewing. 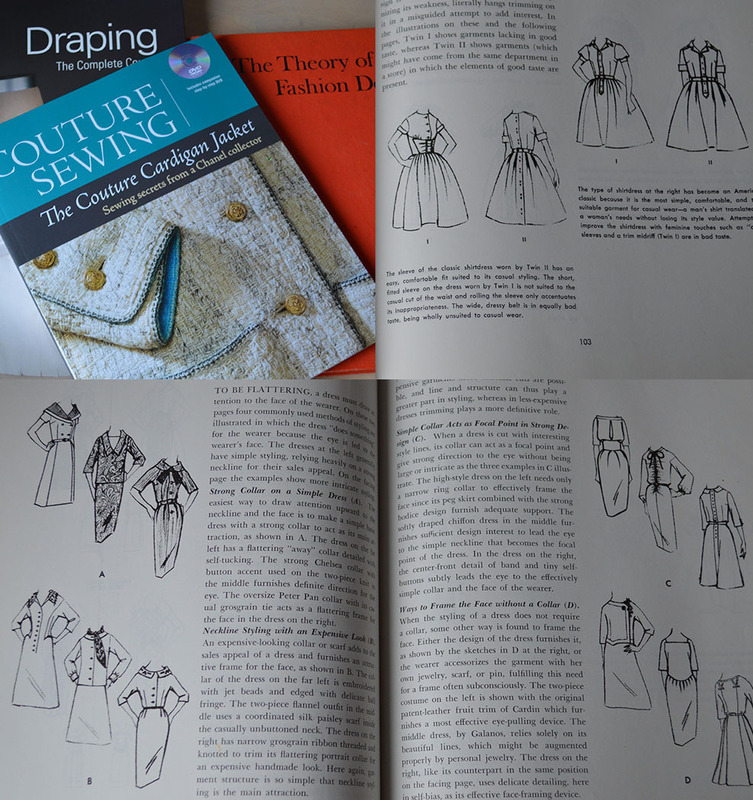 2013 was a pretty good year for technical sewing books (in my opinion): The complete course to draping by Karolyn Kiisel and Couture Sewing: Tailoring Techniques by Claire Shaeffer. Both are pretty interesting reads. I really prefer reading books that aren’t project based but just teach you the nuts and bolts of something or the background about it. I’ve also picked up some great vintage sewing books and I do think that second-hand books are a great option for people learning to sew, the older books sometimes have a lot more detail that you just don’t see in more modern books. Even the pictures in older books are beautifully drawn… I also love their language. No beating around the bush. In one of my vintage sewing books about pattern alteration it bluntly says – most pattern alterations are unnecessary if you lose weight. Not sure you can get away with saying that today! Fellow Lingerie bloggers obviously… One of my favourite blogs/pinterests is The Lingerie Addict. I love it because it highlights products from small independent lingerie brands as well as big commercial brands. Plus it takes promoting a positive body image pretty seriously too whether you are small/petite or plus size, there’s no body bashing talk. Street style… I have a love/hate relationship with London but even I have to admit that London is a pretty damn cool place to live in sometimes and I love that. I love how people mix up what they’re wearing and prove that you don’t have to be head to toe in designer labels to prove you’re stylish and fashionable. You just have to have the confidence to pull it off. 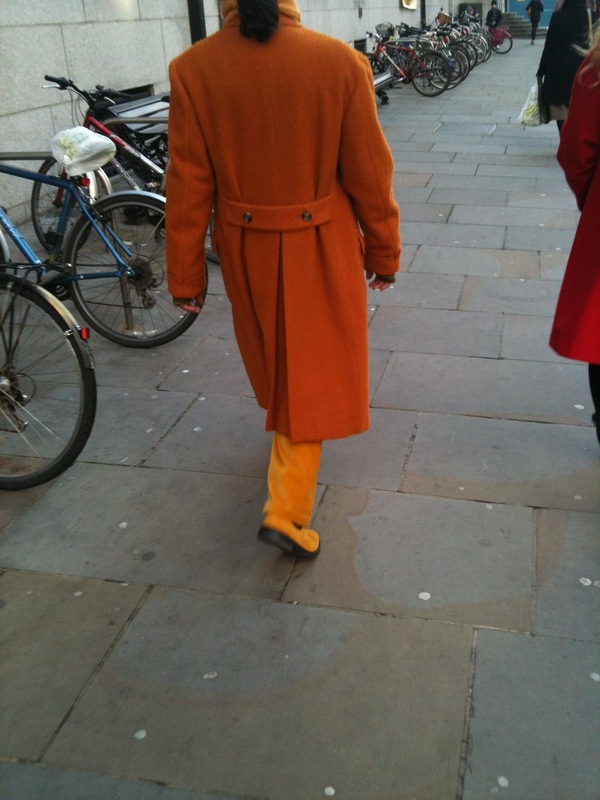 Like this guy – sadly, I only got a picture from the back but he was dressed top to toe in orange… orange turtleneck, orange trousers, orange shoes, everything orange! I’m sad that I didn’t get a picture of the other regular characters that live near to where I used to work – like the safety-pin lady. Covered head to toe in chains of safety pins. Or the parrot man. He walks around with a parrot on his shoulder in normal clothes. First time I walked past him, I thought it was a puppet. It wasn’t! Ok, so it’s not really their fashion or style that inspires me but it’s more their attitude of ‘dare to wear’. « Top 4 Misses of 2013….